Selecting window treatments for sliding patio doors is a pleasant challenge, because there are so many attractive options. Your patio door treatment will cover a great deal of wall space, so it's important to integrate it into your overall room design while balancing the need for important functions such as privacy protection. Some window treatments can also help keep your energy bills down by reducing solar heat gain in the summer and cold drafts during the winter months. An attractive window treatment can help integrate a sliding patio door into your home's decor. Determine the exact dimensions of your patio door, using a tape measure. While there is no single, standardized size for sliding doors, you may be able to find off-the-shelf window treatments for many common patio door configurations. Check out your options in sheers. Sheer drapes allow diffused light into your room while providing some privacy from outdoor passers-by. These filmy curtains are most commonly found in white and off-white shades, although light gray, blue and pastel colors may also be available. You can use sheers as your only window treatment or in conjunction with curtains. 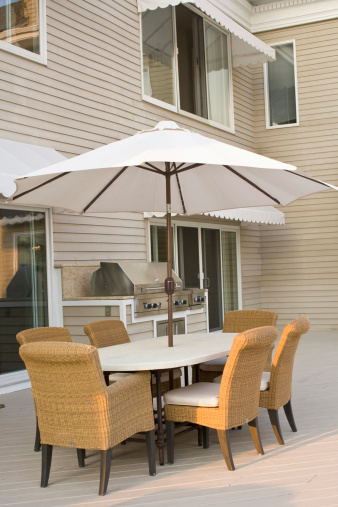 Determine whether you need need to insulate your sliding patio door -- either from outdoor temperatures or noise. Indoor curtains can provide both of those insulating advantages, while adding a traditional decorative element that can completely conceal your patio doors. Decide how open you might like your patio views to be. Vertical blinds can adjust to let you direct strong sunlight away from your eyes, without entirely blocking your view of the outdoors. Vertical blinds are available in translucent or light-blocking plastic, in fabric, metal and wood.